If you are a Barts-MS patient, make sure you head to Whitechapel for a new patient-led group – Coffee and a Chat. 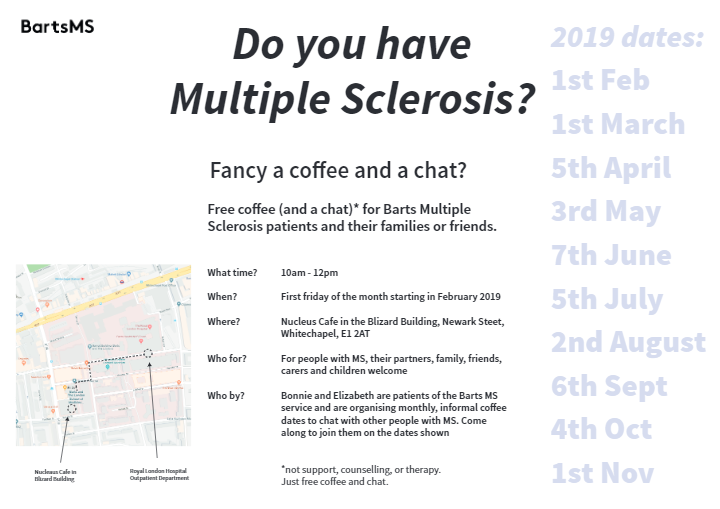 Bonnie and Elizabeth have set up this friendly support network for all patients of Barts-MS.
Come along to the Nucleus cafe in the Blizard building in Whitechapel (E1 2AT) from 10am – 12pm on the first Friday of each month through 2019. The next one is today! Friday 5th April. So if you are travelling to Whitechapel for your appointment, or you live locally, come along for a free coffee and to meet others!